Today, on Thursday 31st December Michel Montecrossa‘s Love & Freedom New Year party and concert will lead you into January 1st 2016 with the happy feeling of new Cyberdance, Cyberrock and Cyberschlager love songs by Michel Montecrossa, Mirakali and Diana Antara. Before the concert tasty New Year menus (vegetarian and non-vegetarian) will be served and you can see the Energy of Art Exhibition of new Michel Montecrossa’s drawings and paintings. On Friday, 1st January, 2 o’clock in the afternoon, you can come to the Miravinci – the meditation centre of Mirapuri – for the distribution of the Mirapuri calendar for the year 2016 and the premiere of the recording of Michel Montecrossa’s New Year ‘Symphony Of Truth And Beauty’ including uplifting New Year Message Recitations for 2016 by Mira Alfassa – The Mother from her book ‘The Great Secret’. 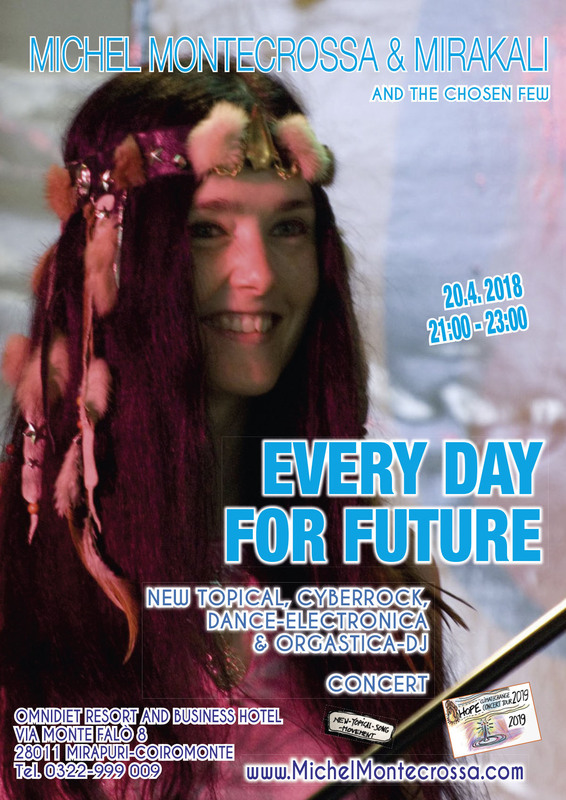 Enjoy this week’s selection of great acoustic and electric New-Topical-Songs and Cyberrock by Michel Montecrossa and Mirakali. Read here about Michel Montecrossa’s New-Topical-Song-Movement. ‘Paris Musing’ is the title of the sixth drawing from Michel Montecrossa’s ’8 Dimensions Series Of Drawings From Paris’ featuring 8 drawings opening into the exceptional beauty of a masterfully transparent experience of what drawings can be. Michel Montecrossa’s ’8 Dimensions Series Of Drawings From Paris’ is only available as complete set of eight framed drawings for a total of 496 000 $. (62 000 $ for each framed drawing. The frame is designed by the artist).